"my love for my fatherland will not die in my heart"
"My portrait or rather the painting that I made for the gallery in Florence was received kindly. A couple of days ago I had letters that placed me in a very good light and compared me to a serious man, none other than Michel Angiolo Buonarroti - I would I could stand alongside him in my works and not only in effigy but he is too terrifying"
"But the sadness in my soul at the loss of my so dearly beloved father and my beloved sister has scarcely diminished if at all...it is a wound in my heart that will never heal as long as I live"
Angelica Kauffman, christened Maria Anna Angelika Catharina Kauffmann, was born October 30, 1741 in Switzerland. Her parents were painter Johann Josef Kauffman and Cleophea, née Luz, who came from a noble family. Kauffman would inhabit and glean the best parts from both of her parents' respective worlds in order to form her own identity. As such she became both a practising artist and a charming and highly cultured hostess circulating within the highest echelons of European society. Most of Kauffman's childhood was spent in the Swiss region of Morbegno, Graubünden, and living surrounding Lake Como, depending on where her father was working. Johann decided to leave Switzerland with his family in 1755, when Angelica was aged sixteen, to search for a larger client base in Austria. This early nomadic lifestyle and already being dedicated to moving in the name of art, helped to shape Kauffman's career as an ''international sensation''. Kauffman's parents recognised their daughter's abilities and talents from an early age and the young girl enjoyed a much fuller and richer education than most girls of the period. Like her mother, she could speak multiple languages including German, Italian, English and French. She also learnt to play the cello and possessed a strong clear singing voice. Writer, De Rossi in his biography on Kauffman recounts the story of how in her teen years Kauffman chose painting over music as a career. The artist's father had taken her to visit a local priest as means to make this difficult decision given that she had talents to do either and enjoyed both fields. The priest advised that life as a performer would give little time for religious observance as a young Catholic woman, and also that although more difficult, painting would ultimately be a more satisfying career. 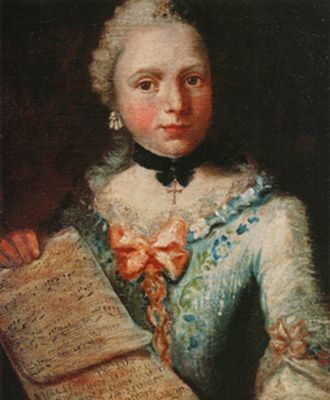 Whether De Rossi's story was anecdotal or true, it certainly gives evidence that Kauffman was highly avant-garde; a typical eighteenth-century woman was not expected to think about or decide for herself which professional career to pursue. The artist's father's anxiety over whether his daughter would get regular work, as artists at this time always operated by obtaining commissions, was unfounded. Johann Kauffman was instrumental in his daughter's early training. Upon the death of Cleophea in 1757, father and daughter moved to her father's birthplace in Schwarzenberg, Austria. Kauffman assisted her father in completing a fresco painting of the Twelve Apostles for a parish church in Schwarzenberg - a rare and exciting opportunity for a girl her age. 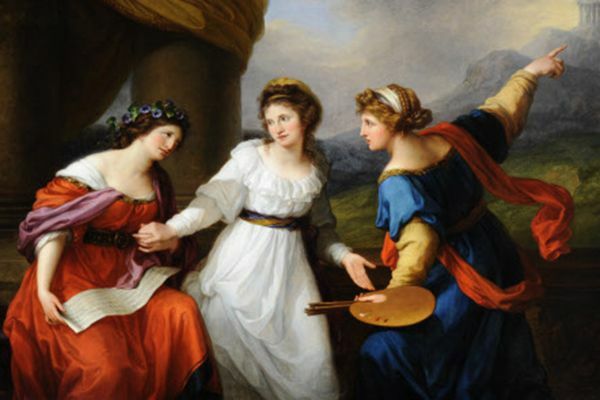 The two continued thus forth to work on commissions together and by the age of twenty it was Angelica Kauffman who had become the family's main breadwinner. In the years after his wife's death Johann dedicated himself completely to Kauffman's training and the period between 1762 and 1764 was defining in this regard. The father and daughter duo travelled to Naples, Rome, Milan, Florence and other cities in Italy spending hours in galleries copying from the Old Master paintings including Raphael, as well as from plaster casts. Kauffman produced etchings, drawings, and paintings all of which helped to build on her knowledge of Renaissance and seventeenth-century painting, as well as to practice her own drawing techniques. The contacts and resources already built by her father gave Kauffman unfettered access to what was usually an exclusively male art world. Even though still young, and effectively at the very beginning of her career, Kaufmann showed such unusual talent that by 1762, she was already an honorary member of the Accademica Clementina di Bologna, and given a diploma from the Accademica del Designo in Florence. She also later joined the Academia di San Luca in Rome. Now with several letters of recommendation to her name, Kauffman was admitted to the royal courts of both Parma and Florence, and here she was commissioned to produce both portraits and history paintings. During Kauffman's travels in Italy she made an important contact. In October 1765 she met Lady Bridget Wentworth Murray, wife of an English envoy, in Venice who persuaded her to travel back to London with her. Kauffman arrived in the capital in 1766 and was to remain there for the next fifteen years of her life. Almost as soon as she had arrived she met the influential painter Joshua Reynolds, and the two became lifelong friends. Augusta Princess of Wales and mother of King George III also came to her studio, a visit that lead to the commission of a portrait of Augusta's eldest daughter, the Duchess of Brunswick. This portrait was widely praised in the newspapers and led to Kauffman receiving even more commissions. A mezzoprint was even made of this painting, and as such by newly established technological means, news of Kauffman's skills travelled even further. Having parted from her father to come to London, she wrote to him shortly after arrival and commented on the double-edged sword of public fame; ''I am now known by everyone here and esteemed. Not only must I maintain my character in keeping with my work, everything else must be arranged accordingly - with a certain propriety that is necessary these days - if one would wish to distinguish oneself''. In view of keeping up with propriety, in Florence she had been given separate rooms to the male artists when copying works. In England, it was revealed, decorum was just as important. For most of Kauffman's career she lived with her father. However, having come to London alone, her reputation was almost irrevocably tarred when she married Frederick de Horn in 1767. Rumoured to be impotent, de Horn was surely a bigamist, and it is thought the pseudo-Swedish Count had tricked Kauffman into marrying him so that he could stay in England. The terrible marriage was quickly annulled with financial help from Kaufman's father. 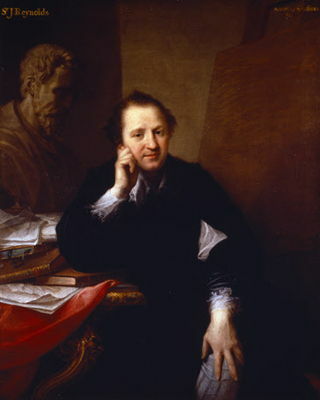 Furthermore, Kauffman's connections to the English royal family and even more so, to the dignified and successful Joshua Reynolds all helped to soon alleviate the social stigma of this separation. Kauffman's fame continued to grow unscathed. 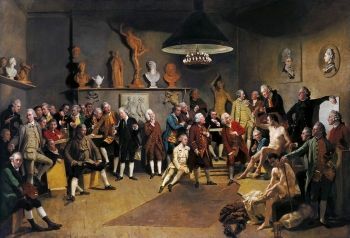 The Academicians of the Royal Academy by Johan Joseph Zoffany (1771-72). Here one can see that the male founders of the Academy are all there in person, whilst the two female founders, Kaufmann included are featured as paintings on the wall. Kauffman proposed to King George III that a Royal Academy of Painting and Sculpture should be established in London. 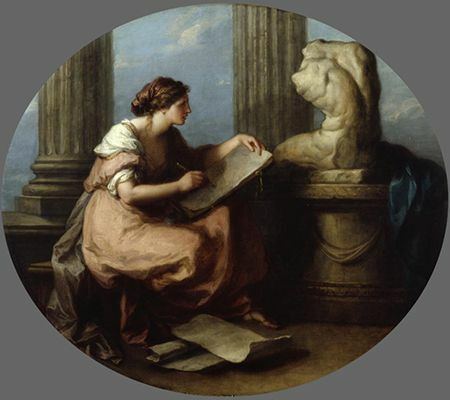 Her entreaty led to her becoming one of only two female co-founders of the Royal Academy established on December 10th, 1768, alongside Reynolds and around 30 other founder members. The only other female co-founder was flower painter Mary Moser. Feminist art historian Whitney Chadwick suggests that this privilege was awarded because ''both were the daughters of foreigners, and that both were active in the group of male painters instrumental in forming the Royal Academy''. In a well-known painting by Zoffany the male academicians are in discussion around male nudes whilst the two pivotal women appear in portraits on the wall, still in some means untouchable and present more in theory than in practice. Yet despite evident inequality, the Academy was supportive and important for Kauffman. She first exhibited there in 1769 and continued to do so until the late 1790s, an official presence that greatly assisted in securing important commissions. As well as history paintings, Kauffman also painted novelists, playwrights, poets, actors, statesmen, philosophers, and royalty, many of whom were her friends. She had many important patrons including the Austrian Governor, the Grand Duke and Grand Duchess of Russia, Queen Caroline and King Ferdinand of Naples, and Prince Poniatowsky of Poland. Gender did however remain an on-going obstacle in her career. Indeed, it was speculated that her physical charms attracted men - including an engagement to Nathaniel Dance in Italy, an apparent wedding proposal from Reynolds, and a flirtation with printmaker William Ryland. Despite such speculation, it was not until the death of her first husband (long after their separation) that she was able to re-marry. 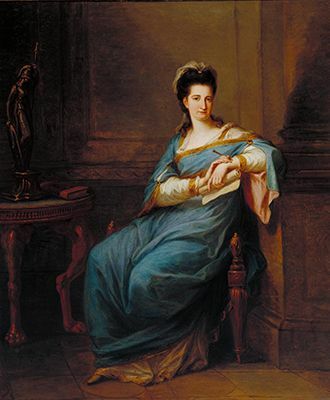 In 1781 she wed Venetian painter Antonio Zucchi, who she met in England as he had been working on commissions in the country alongside Scottish architect Robert Adam. 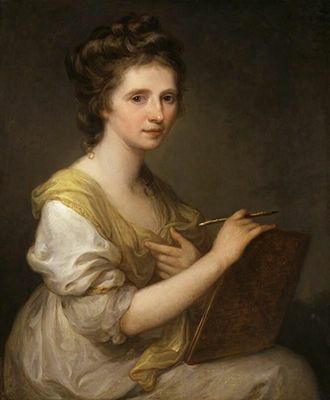 Overall though, Kaufmann did very well to avoid any scandal, whilst other contemporary female portrait artists, including Élisabeth Louise Vigée Le Brunwere not so lucky. Kauffman also adapted very well to English tastes. Influenced by Neoclassicist art and English romantic literature, she produced paintings derived from the writings of Alexander Pope and from Homer as well as classical works such as Zeuxis Selecting Models for his Painting of Helen of Troy (1764). In around 1770 she began to focus principally on history paintings, and along with Benjamin West (one of the few successful history painters working in England) she was one of the first Royal Academy members to exhibit British history paintings and helped to make the genre popular. Kauffman's notoriety in this field shows her high ambitions as the genre was ranked above portraiture, still life, and landscape. 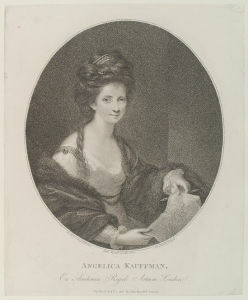 An engraved print circulated in 1780 shows Kauffman at work and heralds her position as a well-respected and established artist. Throughout she enjoyed financial independence as a female painter because her skill was unquestionable. Contemporary diarist Joseph Farington estimated that Kauffman's wealth during her 15-year career based in England came up to around £14, 000 which was an enormous sum at the time. Whilst most of her female contemporaries were already married with children, by age 30, Kauffman shows in her numerous self-portraits that she was different from the others, in her dedication to art. Following her second marriage Kauffman returned to Italy, settling in Rome with Zucchi in 1782. Although she had enjoyed her 15-year stay in Britain, Kauffman felt that history painting was held in much better esteem on the continent and as such it was easier for her to build a good client base and receive regular commissions if she moved there. As in London, her studio and company quickly became well known and she was considered to be ''one of the most cultivated women in Europe''. 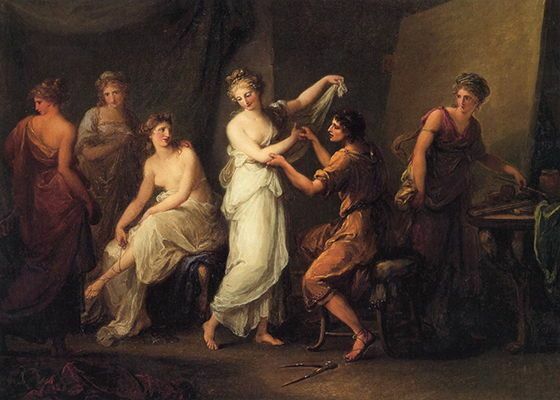 In 1786 Kauffman attended first meetings of Academy of Arcadians, a Roman society of poets. Through the Academy she met and befriended German poets Johann Wolfgang Goethe and Johann Gottfried von Herder. The former affectionately wrote of her ''immense talent'' and said further of his painter friend, that "she was sensitive to all that is true and beautiful, and she is incredibly modest". In 1790 she also painted A Scene in Arcady after a poem by friend George Keate. She had a personal letter-writing correspondence with Keate as well as with many other poets and writers, including the impressive Friedrich Gottlieb Klopstock. Kauffman continued to paint and socialise until the early 1800s. 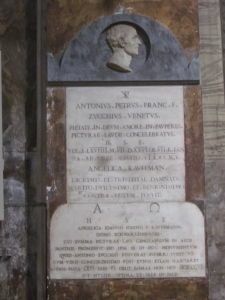 Sculptor Antonia Canova was among those who frequented her home in Rome and became another great friend. Meanwhile, in England Kauffman's fame lived on. Publishers and printmakers became very interested in her work, particularly the line engraver William Wynne Ryland who reproduced and spread Kauffman's images widely. Indeed, her paintings even inspired a new type of decorative printing process - the stipple engraving whereby etched or engraved dots were used to build up tone. Copies of Kauffman's paintings were often found hanging in the most fashionable places in London. Kauffman died on November 5, 1807. 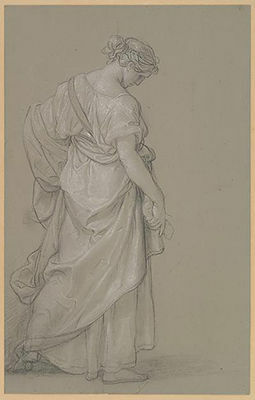 Her friend, the reputable sculptor, Canova, prepared her funeral and it was considered to be the greatest and most elaborate organised for a painter passing in Rome since the death of Raphael. The entire Accademia di San Luca comprised the mournful procession along with various other important ecclesiastics and virtuosi. As a mark of great respect, two of her paintings were even carried alongside the procession. Interestingly, Kauffman spent both the defining early years of her training, and the last part of her career, in Rome. 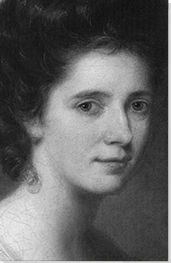 Often described as ''a pioneer'' Angelica Kauffman took everywhere that she went by storm and has a long-lasting legacy. 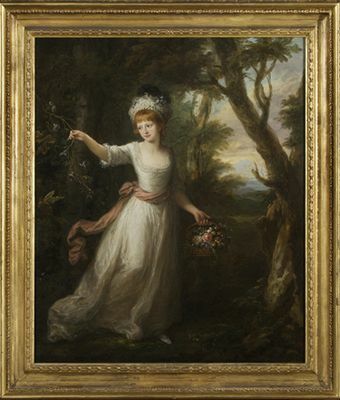 During her lifetime she was one of the highest paid and most sought after portrait artists, second only to her great friend and colleague, Sir Joshua Reynolds. Her skill and dedication to painting was phenomenal and unfailing and as such a great vast variety of autobiographies and articles have been written on her career. Kauffman challenged contemporary perspectives on gender from the very center of the art world, cleverly using the most elite and respected form of art at the time, history painting. She was charming, financially independent, and internationally acclaimed and as such society had little choice but to take her very seriously. A contemporary at the time described the sheer number of prints of her work in circulation around the world as proof that everyone had gone ''angelicamad''. Indeed, it was as though the painter had celebrity status in the eighteenth century something akin to a film star following today. Although an undoubtedly skilled painter and an excellent businesswoman, future centuries did not accept Kauffman as readily as her own. Romantic and idyllic landscape painters including John Constable held the belief that the English School would not be able to make progress until Kauffman's influence had diminished (singling her out in this way), and the Victorian period did not pay attention to her work. Kauffman's friend Goethe was a dedicated supporter Kauffman's talents, but he also comments that her real skill was somewhat diminished by cheap reproductions and the effect that over-commercialisation had on her career. Despite the pitfalls of fame however, Kauffman remains a highly impressive and hugely important female artist. Whilst she used mythology, female muses, and allegory to illustrate the equal strength and status between men and women, it was not until the 20th century that artists started to portray active and empowered female mystics and goddess more widely. When depicted earlier by male artists, female figures were generally passive and used to illuminate an idea of some sort. Kauffman's is a very long-standing influence that continues to grow through the lineage and progression of self-portraiture. When she was thirteen, Kaufmann painted this exquisite self-portrait to show that she was equally talented in music and painting. In a double message, she proudly showcases her talents as well as revealing from the outset that she is interested in self-investigation and discovery. Her palette of icy pink and pastel blue is very reminiscent of earlier eighteenth century Rococo painting and the likes of Jean-Antoine Watteau. Indeed, Kaufmann, by this age was already well versed in art history and had frequented art galleries with her influential artist father.